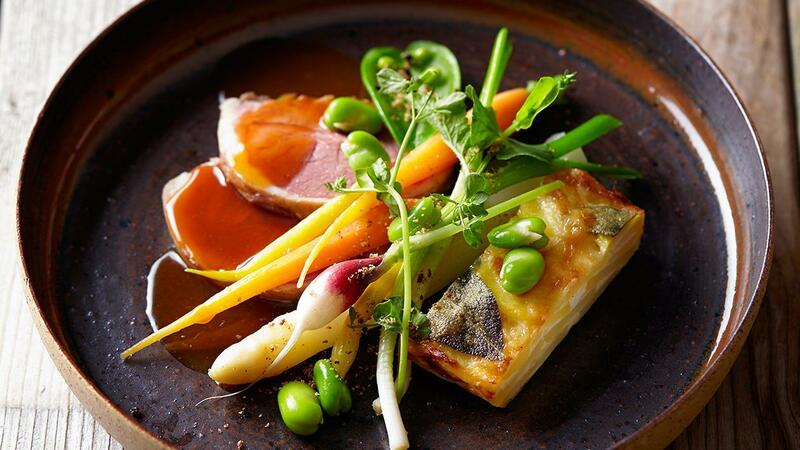 The lamb rump, malaga and potato pie is a classic, but serving it with the baby spring vegetables and a nice gravy with Spanish dessert wine gives the dish a modern twist. Peel and wash the potatoes and cut them into slices of about 4 mm. Mix margarine with the eggs and season with salt and pepper. Mix the potatoes with the egg mixture and the grated cheddar. Distribute the mixture in a suitable greased baking tray and finish off with the sage leaves. Bake the potato pie at 160ºC for about 45 minutes. Season the lamb rumps with salt and pepper and fry them in margarine. Cook the lamb rump in the ovens and then let them rest in aluminium foil. Deglaze the pan with the malaga and loosen the residue. Reduce the gravy and season with the concentrated bouillon. Clean the vegetables and cut them into the desired form. Cut the potato pie and the lamb and divide them across the plates. Spoon the vegetables on together with the radish and crazy pea. Sprinkle on some pata negra crumbs and finish off with the malaga gravy.